Il Duce. 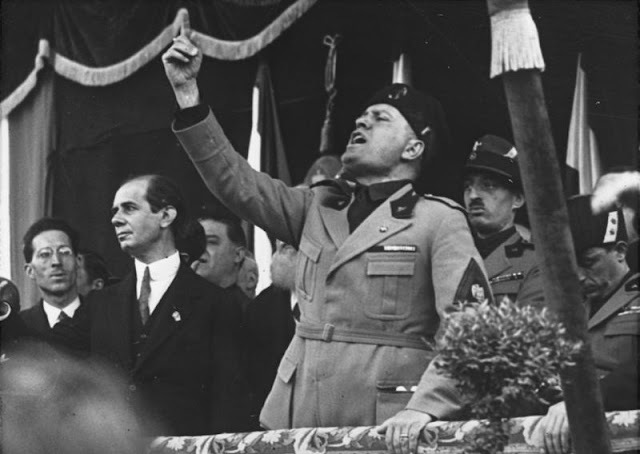 Mussolini in Mailand, May 1930. Photo [CC-BY-SA 3.0] via Wikimedia. Calvino wrote these three short autobiographical stories despite his criticism of autobiographies. The works were written in Italian in 1954, and only translated into English in 2011. The stories tell the tale of Calvino's youth in Mussolini's Italy at the beginning of the Second World War. Calvino was too young to serve when war broke out, and by the time he was of age to serve, he avoided the Fascist draft and become a partisan. A few things stand out for me. Life in the early period of the war seems to have been quite mundane, especially for a teenager. The usual goings-on of teenage life seem to fit, relatively unchanged, into the backdrop of war. Even a trip to the newly conquered French town of Menton provides mostly a backdrop for what a teenage boy might do. At the same time, a subtext of the Fascist movement is ever-present, and subtle hints at the Fascist's glorying in their conquering as if re-imagining a Roman past appear in the actions and words of the adults who direct the boys in their guard and sentry duties. In his translator's introduction, Martin McLaughlin mentions Calvino's relationship with his father, and how the father concludes the three short stories by walking off with his dog to do his normal duties as if nothing else was going on. While the likes of Mortimer Adler have suggested not reading introductions before embarking on a new book, I find it increasingly useful when I am in the early stages of reading an author's works. This is only my fourth Calvino work, and I am yet to grasp the nature of his oeuvre. I found the same when first reading Hemingway, but after learning more about his life and other non-literary background readings, I came to better appreciate his work as I read it. I found the introduction useful with Calvino and I was able to follow the subtle hints to the backstory of his father that I may have otherwise missed. The translation seems to work well, and if anything is lost in translation I can only imagine how brilliant Calvino's work must be in the original (if I could read Italian, that is). Already, I am surprised by the diversity of Calvino's work, especially when compared with Hemingway, where almost all of his work (except perhaps Garden of Eden, although it is somewhat the antithesis) is a variation on a theme. I am intrigued by Calvino. Whether it is reading someone other than an Anglophone I am not sure, but I have the same experience of reading Walter Benjamin or even Harold Bloom. This makes me think that Calvino's literary work is brilliant. And that's it.